David Trotter and Shawn Scheinoha, travel to India and tell a story which focuses on the children of India that are abandoned and homeless. There are 31 million children who are orphans in India. 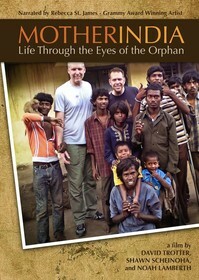 These two men befriend a group of 25 orphans, learn their stories, and begin a process to help the two youngest orphans who will eventually become adopted by a local children's home called HARVEST INDIA. Your heart and soul will hurt for these children who have been abused by their parents, police, and other orphans. You will learn how they beg for money to purchase food each day. You will also learn how in this group of 25 orphans they take care of each other making sure everyone eats, has clothing, protection, and medicine. The children abuse drugs and many of them have HIV and AIDS. We often do not know what is happening in other countries. This documentary brings to light the injustice done to children in India. It is a movie you need to watch. Reading Eggs - Let Learning Be Fun! Pinball for Dads - It Is a Possibility! IRON MAN 3 is Opening Soon! Book Review - Big Nate: Game On! Save Money At The Beach Waterpark This Summer! IRON MAN 3 - Lego Posters! THE BIG WEDDING New Featurette! The Bible Television Miniseries Breaks Records! IRON MAN 3 - New Clip! THE BIG WEDDING New Image!